Schools.com recently ranked Lewis University as number 3 in their ranking of the "Best 4-year Colleges in Illinois.” Focused on affordability, flexibility and student services they used the most recent government data to evaluate colleges and universities across the country and published the findings here. There were 1,649 4-year colleges and universities which were ranked. Criteria included full-time tuition, books and supplies as well as financial aid and student debt. Graduation rates as well as student support services, the ability to earn Advanced Placement and dual credit, career counseling and placement rates also were considered. U.S. News & World Report has ranked Lewis University among the top tier in its rankings of Midwest Regional Universities. U.S. News & World Report ranks institutions with a full range of undergraduate majors and master’s programs. The Best Colleges rankings provide a thorough examination of how nearly 1,800 accredited four-year schools compare on at least 11 widely accepted indicators of excellence. Among the many factors weighed in determining the rankings and key measures of quality are: peer assessment, graduation and retention rates, student selectivity, financial resources, alumni giving, and graduation rate performance. U.S. News' Best Colleges rankings is available on usnews.com, which features extensive statistical profiles for each school. It also includes a college search for students and parents looking for the school that best fits their needs. The Princeton Review also rated colleges based on their academics, admissions selectivity, financial aid, campus safety, quality of life and green initiatives. More information on Lewis University’s ratings can be obtained at www.princetonreview.com. Lewis University has been nationally recognized by Colleges of Distinction. Lewis also has earned recognition as an Illinois College of Distinction and a Catholic College of Distinction. These honors are presented to colleges and universities that are identified by education professionals nationwide as providing a strong focus on teaching undergraduates, a variety of innovative learning opportunities, an active campus with opportunities for personal development, excellence in academics and outstanding student preparation. Lewis University was selected for providing an innovative, teacher-centered undergraduate education with a strong record of preparing its graduates for real-world success. Colleges of Distinction is an online resource www.collegesofdistinction.com that helps students, their families and their counselors select colleges and universities. 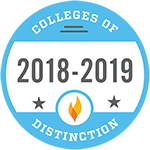 Colleges of Distinction strives to help students find a college where they can grow, learn and ultimately succeed for the rest of their lives. The online college guide describes schools that take a complete approach to admissions decisions, that consistently excel in providing undergraduate education and that have a truly national reputation. Lewis University has been selected for the Great Value Colleges online listing receiving the top ranking among private Illinois colleges and universities in the Midwest. Great Value Colleges is a highly rated website which assists students in finding colleges and universities that provide affordable degree and career options for students. Promising “to help students get the best possible education for their money,” this website features a list of 50 top affordable colleges in the Midwest according to various criteria. Lewis is ranked fifth overall among private schools in the Midwest in terms of being judged a good value and outstanding in its “return on investment” for students. Not all college students go to school straight from high school. Whether they chose to serve in the military, traveled around the world, took care of family, or decided to work before heading off to school, some students wait to attend college until later in life. The number of nontraditional students in college has increased since 2000. 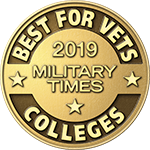 Military Times has released its Best for Vets: Colleges 2019 rankings. Lewis is ranked the #1 Best for Vets school in the state of Illinois and #10 Best for Vets Private School in the United States. The rankings are based on the results of Military Times’ annual survey – the most comprehensive school-by-school assessment of veteran and military student services and rates of academic achievement – as well as a detailed review of public data collected by federal agencies. As is true for all Military Times rankings, Best for Vets: Colleges is an editorially independent, objective and rigorous news project. This feature evaluates the many factors that help make colleges and universities a good fit for service members, military veterans and their families.